I happened down the clay aisle at Michael's yesterday and noticed they were in the process of stocking the shelves with a new Craft Smart brand clay. Judging from the fact that the package says "Distributed by Michael's Stores" — and the fact that I also saw Craft Smart glue, paint, paintbrushes, and more — I'm guessing this is the Michael's store brand. The price stickers were up ($1.29/package), but the shelves were empty. So while the employee was on another aisle, I sneaked a package off of his stocking basket (shhh — don't tell!). Store brands tend to be products that have been manufactured by someone else, then private labeled with the store's brand name. With that in mind, I started trying to figure out who might have manufactured this clay. I originally thought it might be Sculpey III repackaged, based on that clay's popularity. But once I got my packet home and opened it up, it felt softer than Sculpey III. As I played with it a little more, I realized it felt familiar... a lot like that Bake Shop Clay I reviewed a couple of months ago. I investigated a little more and noticed the package directions are the same on the two clays: "Knead clay 2 minutes. Bake at 275 ° for 15 minutes per 1/4" thickness..." The Bake Shop clay was the first clay I'd seen with a specific time in their conditioning instructions, and I doubt it's a coincidence that this new clay's instructions match it. So I feel pretty confident that Michael's new clay is a private label of the Bake Shop clay. There are 15 colors: Black, Brown, Tan, Bright Green, Green, Light Blue, Blue, Purple, Light Purple, Pink, Red, Orange, Yellow, Beige, and White. Like any clay, it may have its uses in the serious clayer's workshop, but overall this is a very soft clay intended for kids. My impressions of the new Michael's Bake Shop clay. I wonder what this means in terms of Michael's continuing to carry Sculpey, Premo, and Fimo. Competition can be a good thing...it is just too bad that some manufacturers continue to promote PC as a "kiddie product." I'll have to look for this next time I'm at Michael's. Doesn't sound like a product I'd buy but it is always interesting to see the new products. I just got back from Michael's! I didn't go down the clay aisle so I don't know if we have it yet. But boy they had a killer amount of beads on sale today. You are so clever. Thanks for the review. Sounds like something I might use for a large background colors-CF style seascapes. Like for covering my pottery vase, bake, and then use the good stuff for the details/turtles/frogs. I do have a pasta machine, but with 'arthur' always showing up to 'help' with my pottery/poly time, soft might work in a specified use. Thanks for the review. Shaungrl: Worth a try! I've known some of the weaker clays to crack when used in thin layers to cover surfaces -- so I'd definitely recommend doing a test run before you put in a lot of work adding decorative elements to your vase. Also, stay tuned for the pasta machine review I'm posting tomorrow... might help a bit with "arthur." Thank you so much for your review on this. I to don't care for it and I'm very disappointed in Michaels for switching to this brand. Thanks again for taking the to work and write about the clay. shape nicely and was very easy to smooth!!!! Thanks for the comments, Jeannie & Iris. Guess that just goes to show, different clays for different folks! I found this clay at my Michael's today. They did not have it out during last week's sale. I squashed a pack with my fingers and it was soft and like marshmallows. Hummmm? Wonder what is really is? I sure hope we don't lose our Premo sales. Thanks for sharing your experiences, Veganosaurus. I'm glad you mentioned strength -- I talked about that in my BakeShop clay review, but didn't mention it here. Yes, it does seem stronger and less brittle once it's baked than other soft clays. That makes it a good option for someone who prefers a really soft clay for working but doesn't like the brittle quality of, say, Sculpey III. Would like to know if anyone has combine the Craft Smart clay with premo. If so, any problems? If not, what might one expect.. weaker? I haven't tried mixing Premo and Craft Smart, Ree, but I'd love to hear your results if you do. Since Bake Shop is less brittle than some other soft clays, I would expect a moderately strong clay when mixed with Premo. It should also give some of the softness of the Craft Smart clay without being too unweildly. Might be a nice mix. Depending on why you're wanting to mix them (to cut costs, to create a certain clay workability), you might also try mixing Premo with UltraLight Sculpey. It's sold in large blocks of white, and I've had nice results mixing it (2 parts Premo to 1 part UltraLight). Since UltraLight is a strong clay after baking, this mixture might be stronger than a Premo/Craft Smart mix. I use the Craft Smart clay to make beads and embellishments. Just because its inexpensive (last week Michael's had it at .89 each!) doesn't mean its not good for grownups! It is easy to work with, and certainly strong enough: Some of my pieces are 3/16-1/8" thick - they are a little flexible when cool, but very durable. I noticed that the black bakes to a semi-gloss finish, whereas the Premo's black baked to a flat matte finish. Not all Craft Smart colors bake glossy; some are more matte, but if you mix white & black, for example, you get semi-matte gray. The one drawback I have with Craft Smart is that it builds up on your hands, and you need to use a scrubby sponge ans soap to wash up before using another color. In this sense, it is not so kid-friendly. Mixing brands seems to work fine so far. Just to let you know, this clay is not meant for kids. People via Youtube-Facebook-Twitter and etc. 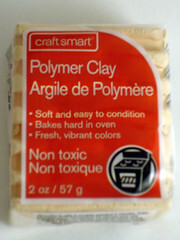 complain that Sculpey-Premo-Femo and so on are all "too hard to work with", so CraftSmart Clay has closed that problem. This is a soft clay yet complete with the same qualities as all those other "professional" brands. So there, i hoped that helped! Interesting... though I have to say I hear a lot more people complaining about the "professional" clay brands being too soft now that they're reformulated. I'm sure there is a market for softer clays, but I suspect that market is beginners and children. Intermediate to expert clayers *generally* prefer clay that is firm enough for caning and will hold its shape for sculpting, textures, molds, etc. I just brought some not to long ago. It's okay but I don't to much care for it. I was thinking it was Premo sculpey brand. My mistake. I don't think I'll be investing in this clay too much. It's rather hard to get soft(for me at least) and it crumbles.